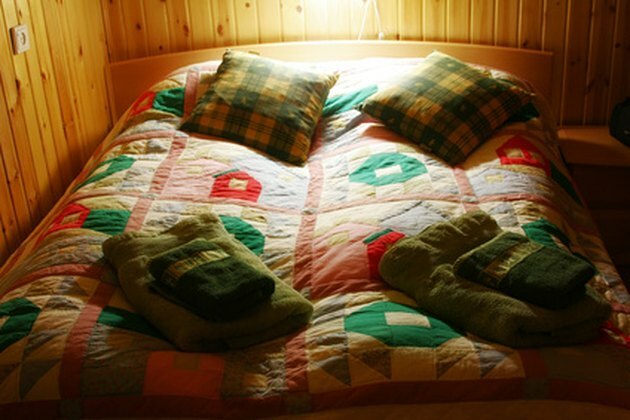 A king-sized bed is 76 inches wide, while a queen-sized bed is 60 inches wide. Therefore, a queen headboard is approximately 16 inches narrower than a king headboard. Nevertheless, with creativity and some time at the home improvement center, you can make the queen headboard work with a king-sized bed. In fact, most modern steel bed frames can accommodate both the queen-sized and the king-sized bed. And the headboard attaches to the bed frame, making the headboard extension much easier. A headboard can be extended to fit a king bed. Remove the headboard from the queen bed. Measure the width of the headboard and compare the width to your king-sized bed frame. The difference in width must be compensated using wood posts applied to the ends of the headboard or intermittently along the face of the board. Each headboard is different. Determine how you would like to apply the posts to make up the difference in width. Cut the posts to a desired length that complements the height of the existing queen bed. 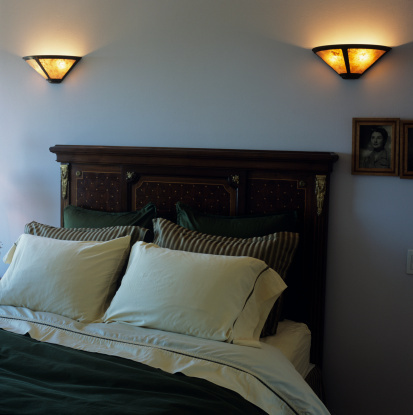 You should be able to use two 6-by-8s or 8-by-8s on either end or five 4-by-4s, evenly spaced across the headboard. Sand the posts to match the finish of your existing queen headboard. If you are going to extend the headboard with 4-by-4s, cut the headboard into 4 equal-width pieces. Drill three pilot holes in each of the posts and ends of the headboard, and ensure these pilot holes line up between the headboard and abutted post. Through the post and adjoining headboard, screw in and countersink the lag screws, or drill the appropriate diameter holes for the cam fastener system. If you use the cams, install and tighten the cams. Add finials or caps to the ends of the posts, and paint or stain the headboard to create a consistent color and finish for the piece. When the finish has dried, attach the bed frame to the headboard.